An in-game donation of PLEX, which allows players to stay subscribed to the game, will send $15 to relief efforts in the Philippines. 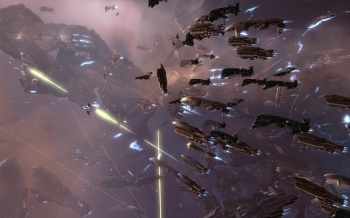 CCP, developer of space-faring MMO EVE Online, is allowing players to donate the in-game item PLEX to help relief efforts in the Philippines, following the destruction caused by Typhoon Haiyan. For each PLEX donation, CCP will contribute $15 to the Icelandic Red Cross for their current humanitarian efforts in the Philippines. For those unfamiliar with EVE Online, a PLEX donation is actually kind of a big deal, as each unit of PLEX gives a player another 30 days subscription to the game. While PLEX can be earned through regular play of EVE Online as well as through direct purchase from CCP, it's still pretty noble of players to literally give up their free time to help those in need. The current drive will last until Saturday, Dec. 7, and CCP is willing to donate up to a maximum of $75,000. For each PLEX donation, players will get two in-game commemorative T-shirts, one male and one female, for their characters to wear. This isn't the first "PLEX for GOOD" campaign run by CCP. Previous efforts have raised more than $100,000 for victims of disasters in Haiti, Japan, Pakistan and the U.S.
Typhoon Haiyan hit the Philippines on Nov. 8, killing 4,000, injuring 12,000 and displacing another three million. If players are looking to help contribute towards relief efforts, they just need to log onto EVE Online and send their PLEX to the character named "CCP PLEX for GOOD," part of the in-game CCP Corporation, using a 14 day item exchange contract.